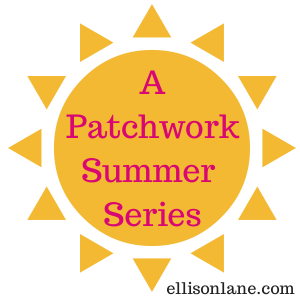 This post originally appeared on Ellison Lane, where I was a guest poster for the Patchwork Summer Series. We will be making a cubish shape with an open bottom. First, we need to do the math to figure out how big to cut the pieces. My serger is 10" wide, 12" deep and 12" tall. We will make the box shape in three pieces, so the front, top and back are all one piece with two side pieces. My front/top/back piece will be 10" wide and 36" long. We'll need to add a seam allowance to the sides, making the largest piece "10.5 x 36." The side pieces will be 12" squares, with seam allowances added to the top and sides, so 12.5" wide by 12.25" tall. We will call the large piece Panel A and the smaller pieces Panel B. You can go ahead and cut your fabrics and batting. You'll need exterior, batting in lining in 1 10.5" x 36" and 2 each in 12.5" x 12.25." Because these pieces will be quilted, you may wish to add an extra inch or so around the edges and trim them to the correct size once you quilt. You also need about 50" of 2.5"width binding or bias tape. Whew, now that the math is over we can get to the fun part - the patchwork! Since my case is going to be 10.5" wide, I am going to do three rows of 10 1.5" squares, you can add more or less to fit your panel, or just add extra exterior fabric to the sides. Lay the squares out in an order pleasing to you and begin chain piecing them into rows. *handy tip - I like to start my chain piecing with a scrap (picture above) to make sure the entire seam is stitched. ** handy tip 2 - starch is your friend when fussy cutting teeny pieces, use plenty before you cut! I am normally a fan of pressing seams open, but that can get fiddly with teeny pieces, so I press these to the sides, alternating direction on each row. That way when you join the rows they lock together nicely and you don't need to pin! Now let's join our patchwork panel to Panel A, the large exterior piece. Take the 36" long piece and cut 3" off. Sew the patchwork strip to the bottom of the 33" piece and then sew the 3" piece to the bottom of the patchwork strip. (This will be longer than necessary now, but we will trim it down to size after we quilt). Next, make your quilt sandwiches. Each of your three sandwiches will start with the lining fabric right side down, batting and then exterior, right side up. You will have one long panel and two squarish ones. You can spray baste or safety pin the layers together. If you wish, mark them for quilting. I used a hera marker which creases the fabric but doesn't use any type of ink to worry about. Quilt your three sandwiches any way you like. I used a diamond pattern and machine quilted it using a 3.0 stitch length. Once you have quilted your pieces, trim them to size. Mark the top two corners of each your Panel B's at 1/4" on the lining side. Now line up one of the Panel B's (yellow) with Panel A (orange). Sew a 1/4" seam until you reach the 1/4" mark at the corner, securing seam by backstitching at start and finish. Wrap Panel A around the corner and continue sewing until the next quarter inch mark in the corner. Repeat the process for the third side. Repeat again, joining the other Panel B with Panel A. You can finish the raw edge seams by sewing a wide zig zag stitch over them, serging them or wrapping them in bias or seam binding tape, if you wish. Turn your cover right side out and press the seams toward the B panels. The last step is to apply binding or bias tape to the bottom/open edge. You can do this exactly how you bind a quilt. If you have never bound a quilt, I suggest a look at this tutorial. The one difference that makes it easier for this project is to attach it to the backside first. I think this helps to keep everything lined up, making sure the seams go toward the side B panels. Then I just turned the binding up to the outsides and sewed it down at a scant 1/8." Now you have a beautiful new cover to brighten up your sewing space and keep your machine clean and lint free!